Acuité Ratings’ study of India’s Manufacturing PMI for August 2018 indicates that there is optimism on new orders and a positive outlook on fresh hiring. While comparing the overall Manufacturing PMI performance of both India and China, we assess that the former has been a consistently better performer over the past few quarters. India’s YTD (April-August 2018) PMI performance for FY19 is recorded at 52.0 as against 50.8 for the same period last year. China, on the other hand, recorded a stagnant YTD PMI at 51.46 as compared to 51.44. While the India PMI gained almost 120 bps since last year, the Chinese PMI gained just 2 bps. 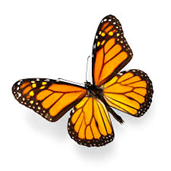 Acuité believes that this is primarily driven by the uncertainty from the US led trade wars, the consequent impact on new export orders in China and the likely benefit accruing to the Indian manufacturing exports. The Manufacturing Purchasing Managers Index (PMI) measures the overall sentiment of the manufacturing segment of an economy by incorporating views from a panel of purchasing managers; an index over the figure of 50 means business expansion. 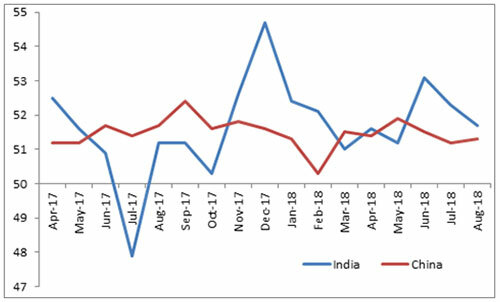 Our analysis of the Manufacturing PMI for India reveals that the index has remained over 51.0 since almost the last one year despite the monthly volatility that is typically seen in PMI. 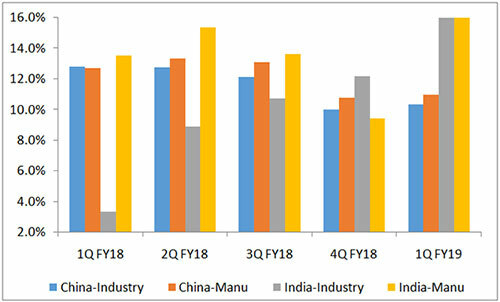 Indian manufacturing, as per the survey and the reflected PMI print states that employment opportunities and new orders are in expansionary mode. New orders and overseas orders recorded a continuous expansion in India - tenth month in a row. This reflects the improving sentiments in the manufacturing sector including those for exporters, hiring plans and outlook on business growth. Given the depreciation of the rupee vis-à-vis the dollar over the last three months, the competitiveness has improved for exporters and has also strengthened the confidence on export orders. The underlying optimism on fresh manufacturing orders, nonetheless, is partly offset by the rising concerns on input costs primarily those related to fuel and commodities. This explains the moderation of the PMI from over 52 to 51 plus levels. What has caught our interest is the correlation between the Manufacturing PMI for India and China. China, the global manufacturing powerhouse, had seen a sharp contraction in PMI to 50.8 during February 2018 and is yet to recover from that weak trend. While comparing the overall Manufacturing PMI performance of both India and China on a YTD basis, we assess that the former has been a consistently better performer over the past few months. India’s YTD PMI performance for FY19 is recorded at 52.0 as against 50.8 same time last year. China, on the other hand, recorded a YTD PMI at 51.46 as compared to 51.44. This means that while Indian PMI gained almost 120 bps since last year, the Chinese PMI gained just 2 bps, therefore remaining stagnant. This is likely due to the ongoing trade wars between US and China, the expected sanctions on imports from China and its impact on upcoming orders. The business outlook apart, Chinese exporters have also witnessed intensifying cost pressures due to restructuring, environmental compliance and tighter fiscal policy. The above graph on the divergent trends in the growth of the manufacturing sector in China and India, also corroborates our inference. While China recorded a manufacturing growth of 11.0% in Q1 FY19 (normalized to Indian financial year standard), India expanded its manufacturing activity by 18.0%. What’s heartening is that such a growth in India comes in the context of a strong base of 13.5% as compared to China’s 12.7% in Q1 FY18. There is significant divergence since Q4 FY18 between the two nations when Chinese manufacturing growth was nearly 140 bps higher than that of India. While it may be a bit premature to assess the situation at the ground level, preliminary diagnosis does reveal that China’s manufacturing sector has been negatively impacted by the ongoing trade tensions with US. India may be the beneficiary of such trade conflict in the near term; however, the sustainability of such a trend needs to be seen over the next few quarters. This is particularly in the context of input cost escalation and the inflationary pressures on the Indian manufacturing sector. Insolvency And Bankruptcy: Will The Recovery Game Change In India?